Student travellers represent a key demographic for travel-brand growth, but only if brands commit to understanding the evolving wants and needs of this primarily youth-driven segment. 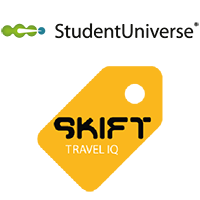 In their joint report of the same name, StudentUniverse and Skift define the student traveller, frame their in-destination desires, and break out key changes already happening industry-wide to address the revenue that travel verticals stand to mine within the student-travel space. Who is the student traveller and what do they want travel brands to supply? How the global nature of the student traveller is evolving, and how the incorporation of technology (but also one-to-one human interaction), alternative tourism activities, and even good design can help court them. James will also take questions from the audience during the session. As a journalist, James O’Brien, Ph.D. covers business, travel, technology, social media, marketing, film, food, wine, the profession of writing, and news. The Nieman Journalism Lab has called his work in the custom content space ‘sponsored content done right’. He has written for major regional newspapers, and he has managed and edited established, startup, and turnaround newsrooms in varied markets, from community papers to major-city dailies. Limited spaces are available so pre-booking is essential – simply click below to complete the registration form and we’ll send you full details of how to join the session. If this webinar may be of interest to a colleague, then simply forward them the link to this page so that they can register too. Our webinars are free for members of WYSE Travel Confederation and EUR 75 per session or EUR 250 for the entire 2014 series for non-member organisations.